Have you ever had one of those days where you wished you could just throw everything you owned into a duffle bag and head to the beach? A family vacation sounds like a wonderful idea right about now and it has taken everything in my being to keep focus on the “here and now”. Time away is essential for families. But why? Does it really matter? Should it really be a priority to get away? When I was growing up,our yearly family vacation looked a lot different then they do now, but I look back on all those family camping trips and long car rides to my grandmothers house with fondness rather than disappointment because even though it was just for a little while, I could forget about my troubles and just enjoy myself. I’ve heard people make excuses about why they can never take a vacation. When I was first married we didn’t have the money to travel but my husband insists on it and I am forever grateful! At first it was just a weekend away just the two of us to celebrate our anniversary. A few years later we went on a cruise to Hawaii and a couple years after that the two of us snuck away for a wedding in Mexico. As wonderful as it is to go away just the two of us it’s just not the same without the kids so … now we are the ones planning our family vacations and believe you me they look nothing like the ones we went on as kids. Rest and relaxation. I find it really easy to get caught up in our daily routine and its really easy to forget to enjoy ourselves. 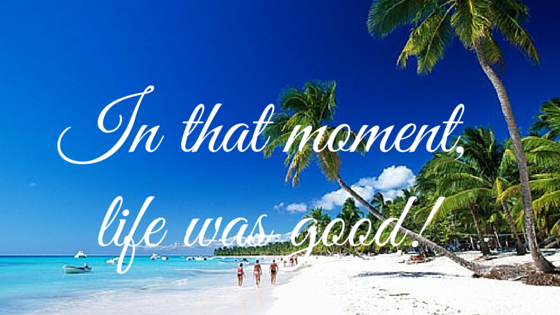 Taking a trip gets the focus off responsibilities and onto those we love most. The laundry can wait! Strengthen family bonds. This very well may be the last big family vacation we are going on as an family and I am looking forward to spending time together laughing and enjoying each others company. Change of scenery enhances our mood and uplifts our attitude. Just try to walk though Disney World while angry with someone, or watch a sunset without feeling a sense of peace, or build a sandcastle with a frown on your face. There is just something about being in a new place that brings out a sense of satisfaction. Create family memories. Memories are powerful. They can spark strong emotions in an instant. Life is hard, dang hard and we need time away so we can drown out the negative with something positive, so we have something to smile about when we look back. Families benefit from taking trips, whether for the day or for a couple weeks. How can you plan an outing for your family in the near future? 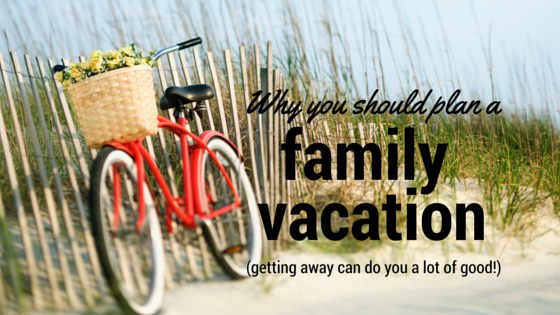 Those are all great reasons to take a family vacation. I was actually just looking at my daughters’ school calendar today, starting to plan our next trip. We like the idea of escaping the Northeast US Winter by heading to the tropics around this time of year!!! Any time is a great time for a family vacation, yes? 🙂 Most especially right now (except for school, dang it). My husband and I went years without a vacation or family vacation. But then the youngest two children came along (adopted) and they have special needs. A huge portion of their learning is through life experiences so now family travel is a regular event for us. We are in the middle of planning for a fall Disney trip!!! Eeek! So exciting! I agree! We’re planning small day trips! I can’t wait for my son to be out! The moment we checked out of our condo in Cape Cod this year, we booked the 2016 vacation and that way we have that to look forward to. Oh yes, we are planning our first real get-away family vacation this summer. I can’t wait to begin this family tradition. These are some great points. A vaccination would be really nice. I’d love to go out of the country for the first time in a while. We have been talking about our vacation plans for next year already. We know we need that time away as a family. We just had a family vacation in October and it was so nice spending time relaxing together. I love going on family vacations and only wish we could go on them more often. We love our family vacation. We plan and save all year for one big one week. We definitely don’t vacation like we should, but the few times we have gotten away, even for a few days, we always make the most of it. It’s so true that everyone needs a change of pace, scenery, and some new exposure once in awhile! We try to go on family vacations every year and spend time together. I love going out with my family and just unplugging for a while. I will take a family vacation anytime 😉 I love to travel with the family and explore new places. I’m with Robin. Pack me up and let’s go, I love to travel.